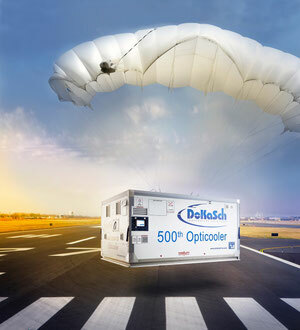 ULD provider DoKaSch Temperature Solutions added transport box number 500 to its fleet of Opticoolers. However, that’s not the end of the line since more active cool containers will join the fleet, pushing the Kelsterbach near Rhine-Main Airport-based company’s expansion further ahead, announces the firm in a release issued today (4 September). The pharma business turns out to be a contemporary El Dorado not only for producers like Eli Lilly, Novartis, Fresenius Medical Care, Baxter International and many others but also for the air freight industry. Shown by the double-digit growth of pharma shipments flown around the world year after year. An ongoing trend that years ago caught the attention of specialists such as Swedish firm Envirotainer or Germany-based DoKaSch, offering forwarders, airlines and producers of pharmaceutical and medical products sophisticated transport units that maintain constant temperatures on the inside over many hours and when moved across climate zones and continents. The initiative to develop adequate transport boxes for safely flying extremely temperature sensitive items over a timespan of many hours came from airlines and pharma producers. That’s why ULD producer DoKaSch ultimately launched its Opticooler program, with first units delivered in 2004 to its initial customer Lufthansa Cargo that had committed to purchase up to 100 active cool containers. In view of growing demand, DoKaSch decided in 2014 to broaden its strategy, offering their RAP-Opticoolers to other carriers, although on lease conditions only. The technically highly sophisticated containers belong to the species of active cool boxes. They are equipped with battery powered cooling compressors and heaters as well as a self-regulating temperature control, ensuring that the internal temperatures consistently stay within a certain range of Celsius degrees, no matter where the goods are stored within the cool boxes. Temperatures between 2 - 8°C or 15 - 25°C for example can be maintained, regardless of the ambient climate conditions. These can be extreme without doing any harm to the shipments stored inside an Opticooler, no matter which temperatures there are outside, be it -30°C during a Canadian winter or +50°C in the Middle East during summer. This way, the Opticoolers resemble flying warehouses whose batteries only need to be recharged after a flight or at a stopover of an aircraft to assure that sufficient power is available for the onward flight or to deal with unexpected events. DoKaSch Temperature Solutions holds that a full battery charge, from 50 to 100 percent, can be achieved approximately within two hours. “We are proud, that our products have proven worthy in the day to day air cargo business and that we can offer our customers an extremely reliable product. We therefore provide a solution to tackle the difficulties in the global cool chain logistic,” says Andreas Seitz, managing director of DoKaSch Temperature Solutions. He announces that more RAP Opticooler units are to follow. So it seems that the 500th box is only an interim result.